The frigate HMS Iron Duke intercepted a speedboat north of Barbados and seized a large haul of cocaine. Rates about a two or three on a ten-point interest scale. However, Sub Lieutenant Wales a.k.a Prince William was serving on board and was involved, so in the British press this rates a ten! 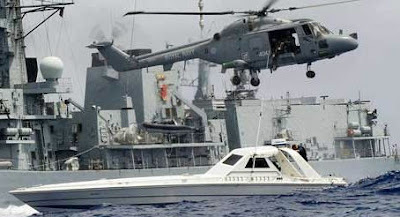 If you read the articles in the more staid newspapers you find that “The British Royal Navy ship on which Prince William is serving” was involved in this, with “Wills” serving as a spotter on a Lynx helicopter, along with a pilot, a command observer, a Marine armed with a high-powered sniper rifle, another commando with a machinegun, and an American coastguard. Either they followed the vessel in question for three days (following a tip) before seizing it OR the Lynx/Prince William spotted it and they became suspicious that a small speedboat was so far out to sea…. The story starts to grow as you get to the yellow press. Now it’s “Prince William’s ship”; “Wills’ helicopter”; they “swooped on a suspicious powerboat north east of Barbados”; “the group of young sailors battled for 14 hours in rough seas - often in darkness - to enable coastguards to seize the speedboat and its cargo”; “The six-strong crew put themselves in dire danger as they hovered just feet above the craft and ordered it to stop”; etc., etc. OK, so “The six-strong crew put themselves in dire danger as they hovered just feet above the craft and ordered it to stop. A military source said last night: “If the drug runners had decided to open fire with machineguns it could have been very sticky for Prince William.” Very clever indeed!